Akumal beach hotels with spa are simply the best way to enjoy a relaxing beach vacation along the Riviera Maya in Mexico. Whether you are looking for family friendly or adult only beachfront or waterfront Akumal hotels with spa or vacation rentals, this small town known for sea turtles, is a favourite along the Mayan Riviera. Akumal is a beautiful little tourist town just east of the island of Cozumel, between Playa del Carmen and Tulum. Known for its beautiful and calm bay you will love the sandy beaches and slower pace of the more well known tourist towns. Akumal in Mayan means "place of turtles". It is important for any tourist visiting the area to fully understand and do their part to be environmentally conscious and not touch the turtles or coral on the reefs. Known for snorkelling with green sea turtles, this should be done only with certified tour guides. This 5 Star, all inclusive, family friendly Akumal beach hotel is located on a beautiful Riviera Maya beach with turquoise blue water and soft sand. A 15 minute walk to the busier part of town makes it close enough to enjoy the town but far enough for some great R&R at the full service rustic spa and wellness centre. The resort had a major renovation done in 2014. The rooms are of modern decor and well maintained. Everyone will enjoy the various pools as well as hammocks and outdoor beds by the pool. Half Moon Bay and Riviera Maya Golf Club is just 3 miles (5Km.) away. Enjoy some great snorkelling or scuba diving. The Akumal Bay Beach & Wellness Resort is recipient to both Certificate of Excellence as well as Traveler's Choice Awards from TripAdvisor. An excellent choice. A lovely family friendly Akumal boutique beach resort just a ways out of town so you can enjoy some peace, privacy and serenity. Each of the 26 suites have fully equipped small kitchens for those who love to cook their very special meals. Choose from 1,2, or 3 bedroom villas for romantic or family beach vacation along the beautiful Riviera Maya. Make it your own waterfront villa without all the responsibility that comes with ownership. Enjoy a massage, facial or other body treatments from the on location spa. Beautiful landscaping makes this Akumal boutique beach hotel a very good choice for those seeking some great R&R with family and friends. Although family friendly, other Akumal beach hotels will offer more to do for the children. Located on a beautiful 1/2 mile (800 meters) of sandy beach, these luxurious Akumal beach hotels have everything for the whole family. 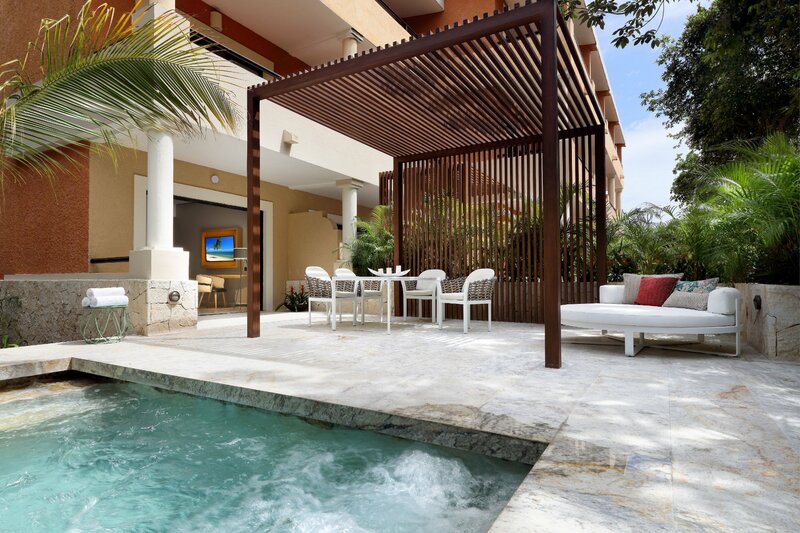 Sharing all the facilities (except Royal Suite facilities) of the other Akumal Palladium resorts makes this the largest of all the waterfront resorts in Akumal. Guests can enjoy Infinite Indulgence® can where everything is included. The kid friendly facilities and activities will keep your children well occupied. The resort accommodates babies at the baby club from 1-3 years old, El Ranchito club from 4 to 12, Black and White Junior club from 13 to 18 years! The six luxurious freshwater pools are fantastic for the whole family. Adults will also enjoy exclusive areas as well. The Zentropia Spa and Wellness Center is always a highlight for those seeking peace and serenity. For those who love sports, there is a soccer field, tennis courts, volleyball etc.. They also have a good variety of shows in the evenings. You will enjoy a wide variety of the 9 restaurants as well as 5 buffet style restaurants. There are 25 bars and a total of 9 pools. Many activities such as snorkelling, scuba diving or land tours and excursions can be arranged with the hotel providing services through reputable tour companies and guides. As we mentioned... 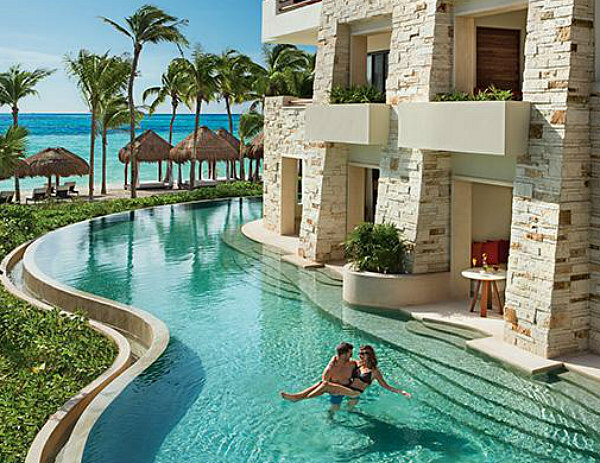 The Palladium resorts in Akumal offers almost everything for everyone in the family. For a golf course... see Luxury Bahia Principe Akumal! 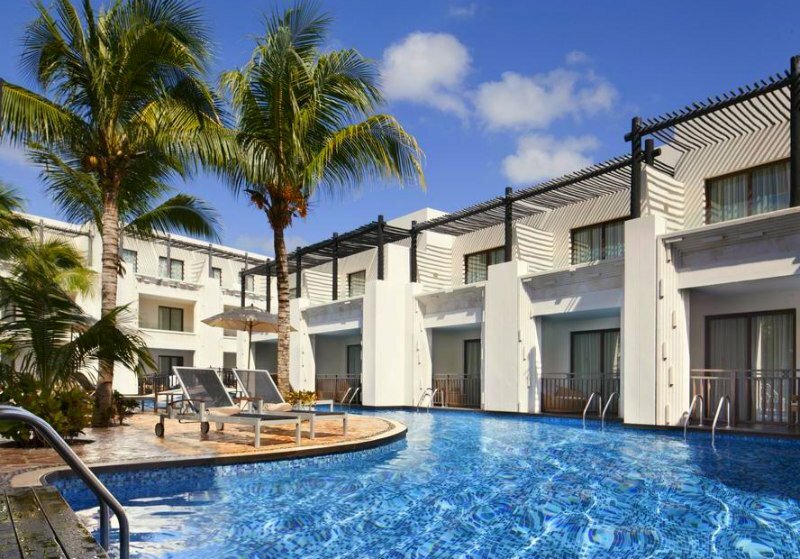 If you are desiring use of all the facilities that this vast property has to offer without children you will want to look at the TRS Yucatan Hotel as it shares this property as well. If golf is part of your Akumal beach vacation plan, we strongly suggest this beautiful 5 Star family friendly Akumal beach hotel and spa. Enjoy a great game of golf at the Riviera Maya Golf Club which is part of this luxurious resort! The Robert Trent Jones II designed golf course is sure to please most golfers and those who wish to learn how to golf. The Riviera Maya Golf Club was recently acknowledged by Golf Digest magazine as one of the best golf resorts in Mexico and the Americas! If tennis is your game there are 5 courts to tire keep you busy as well as a basketball court. You will also enjoy many water sports and children may have a chance to swim with the dolphins. There are two clubs for children aged 4-12 and 11-16. Getting tired from all the available activities? You can slow down and enjoy the beautiful beach or a beautiful spa day. 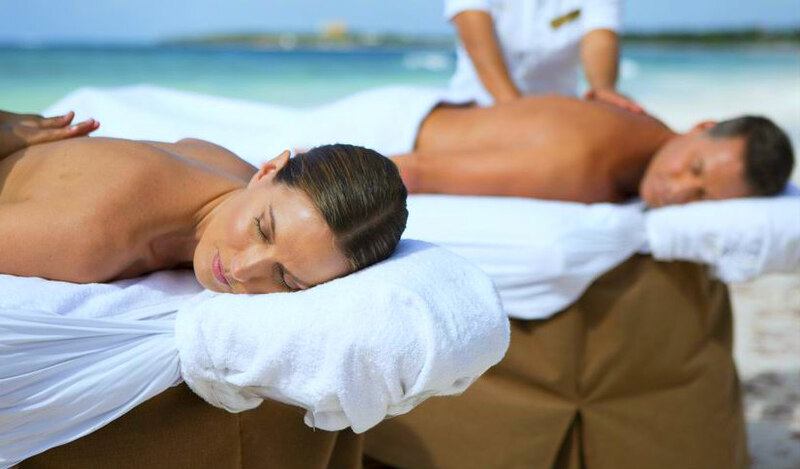 You will find head to toe treatments at the Bahia Spa at Akumal. A Certificate of Excellence Award winner makes this one of the great Akumal beach hotels. 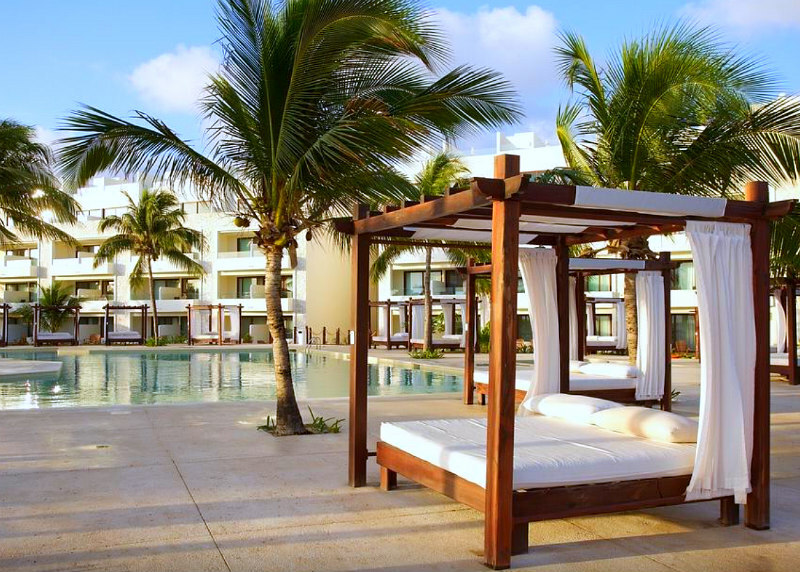 Enjoy the 5 star luxury of the Grand Bahia Principe Tulum beach hotel surrounded by natural tropical landscapes. Choose the pool, jetted tubs or the beautiful ocean beach to cool down from the warm tropical sun, they are only steps away from each other. 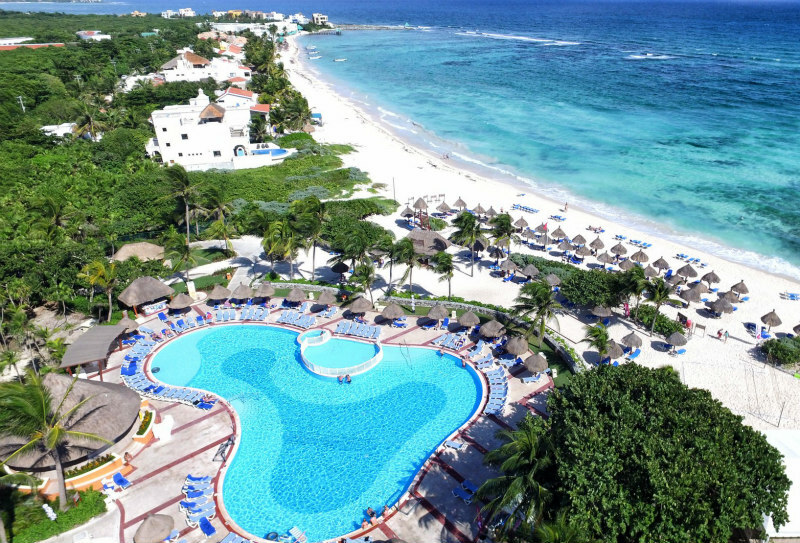 This family friendly Akumal beach hotel features a fairly large children's water park which is always a big hit with the kids. Children (4-12) also enjoy the various activities offered at the Mini Club. Enjoy reciprocal to all facilities at the Grand Bahia Principe Coba except the restaurants. The parents will enjoy access to the Riviera Maya Golf Club as well as many other adult activities. After a day filled with activities you can enjoy hydrotherapy at the Bahia Spa Tulum as well as a full list of services and lovely facility. A Certificate of Excellence Award winner makes this beach hotel in Akumal a great choice. 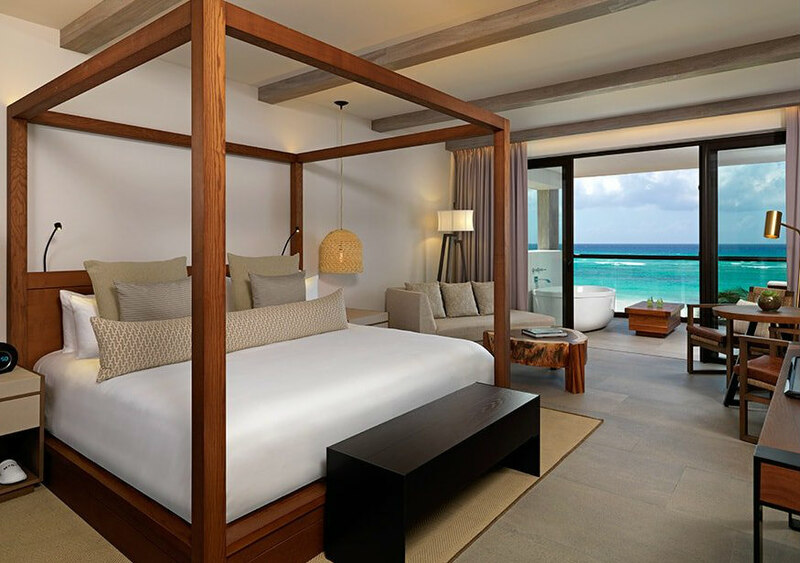 Secrets Akumal Riviera Maya is one of the newest Akumal beach hotels in the Riviera Maya. This adults only resort is located upon a pristine white sand beach offers Unlimited-Luxury® for your complete all inclusive experience. An expansive luxury infinity pool as well as 11 other pools are sure to please. Enjoy complimentary golf at the Riviera Maya Golf Club, tennis, fitness center, great evening entertainment, and of course a beautiful expansive Secrets Spa by Pevonia® spanning over 18,000 sq. ft.. The spa offers the latest in hydrotherapy as well as many other massage and beauty treatments. Each of the private sanctuary suites is equipped with luxurious whirlpool tubs for two. All are smoke free with many having expansive ocean views. 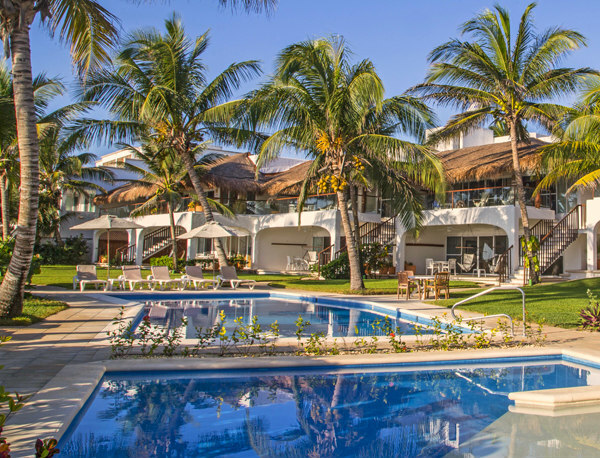 Environmentally friendly, this Akumal beach hotel is Rainforest Alliance Certified™. This is an excellent choice for romantic couples looking to enjoy a peaceful but not boring waterfront destination along the Riviera Maya. Cocooned amongst the tropical forest with a beautiful white sandy beach you will find this beautiful all inclusive Akumal waterfront resort with spa dedicated to adult only vacation. The three stunning pools offer plenty of loungers as well as great food and drink service. The rooms are spacious starting at 624 sq. feet and tastefully decorated. Some rooms have soaker tubs on the terrace with great ocean views. Enjoy full services at the fitness center, spa and beauty salon. There are plenty of day activities while the evenings are a little quieter. Perfect for romantic evenings along the beautiful white sand beach. 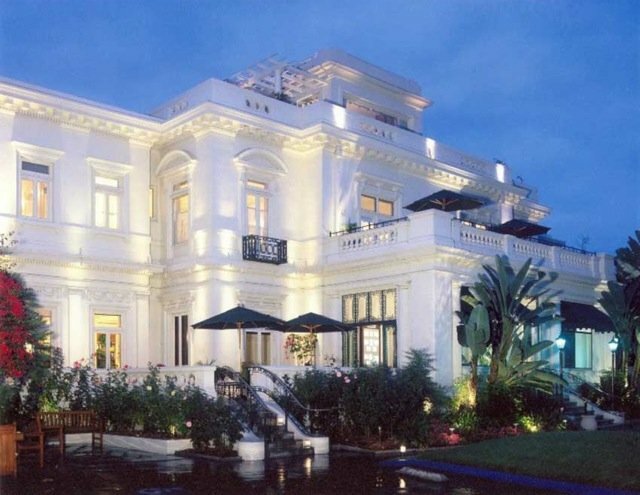 The four restaurants are absolutely first class with excellent menus. A great 5 star Akumal beach hotel waiting to serve you and give you the much needed rest you deserve. 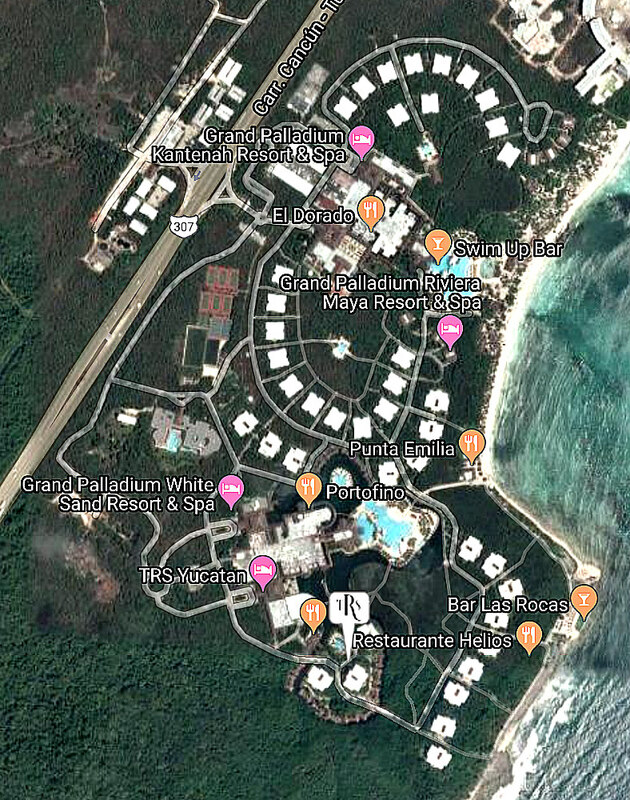 Definitely one of the very best 5 Star beach hotels in Akumal, this adults only resort gets the bonus of all available amenities of the larger family friendly Palladium group of hotels. However the rest of the hotels do not get to enjoy the extra luxuries or more private atmosphere of this part of the property. The spacious suites start at 645 to 1345 sq. feet of luxury. The exclusive pools are luxurious. Choose from infinity, salt water or Jacuzzi. Guests will experience extra special treatment at the beautiful Zentropia Palladium Spa and Wellness Centre. Guests may choose from any of the restaurants of the other hotels within the Palladium group but also have an exclusive 4 a la carte restaurants, 3 bars, exclusive VIP beach area with Bali beds and waiter service. This resort will give you all the activities of the complete Palladium Resort or the choice of privacy and romance. Excellent choice of beach hotel along the Riviera Maya! 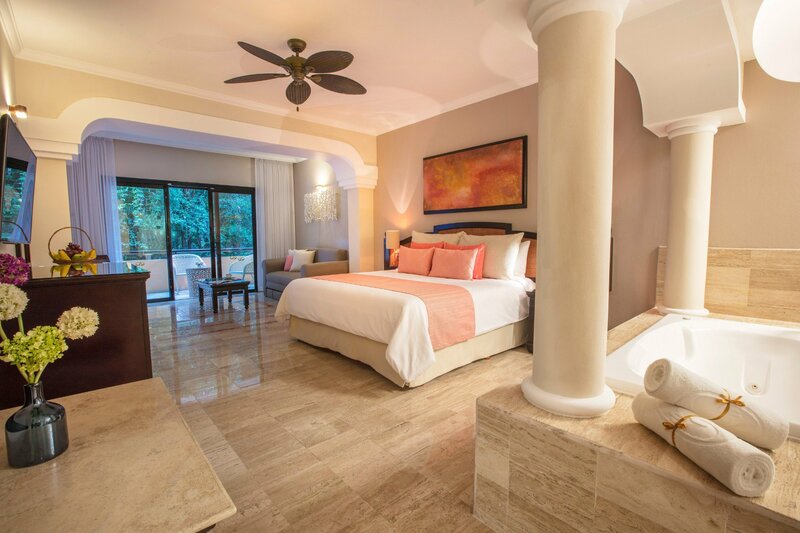 "Akumal Breakers" Luxury Akumal beachfront vacation rental! Akumal waterfront or beachfront vacation rentals can be perfect for families wanting privacy or wanting to cook for themselves due to diet restrictions or more freedom to move. Vacation rentals are great for extended family vacations or groups of friends. 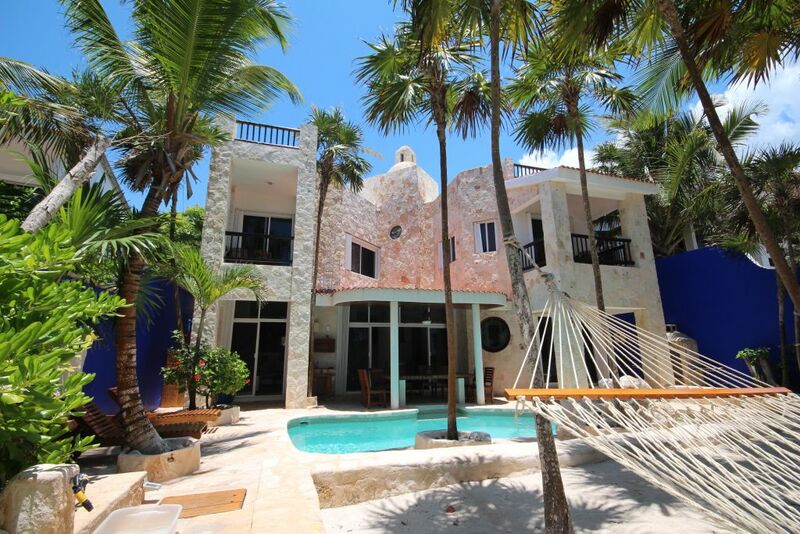 Akumal beachfront vacation rentals can save a lot of money for larger groups. Always ensure your "waterfront" or "beachfront" Akumal vacation rental is truly on the beach. Also ensure of its vicinity to the town of Akumal. Good value Akumal waterfront vacation rentals up to 400.00 per night. Luxury Akumal waterfront vacation rentals over $400.00 per night.